As you may have noticed, I haven’t posted any garments lately. That’s not because I haven’t been sewing. I actually have been sewing a lot — I just don’t have anything completely finished! I have been making 1920’s outfits for my husband and I for the Gatsby Summer Afternoon next month in Oakland. My dress is a seafoam and yellow floral chiffon dress from 1928 and I’m also making my hat, purse and gloves to go with it. I have the buckram for my hat all put together, but had been waiting for my silk dupioni to arrive to cover it. I already have my shoes, stockings, jewelry and parasol and all the fixings for our picnic. Right now, I’m working on Brian’s outfit — shirt, vest and golf cap. We picked up some vintage trousers at a thrift store the other day and I bought a silk foulard tie on ebay for him. He just needs to get some brown wingtips and he’s set! So, right now I am working on his shirt. I made a muslin of it first as I had only made one button down shirt previously and that was a banded collar one I made for myself for an Old West outfit (complete with vest and split riding skirt!). I am sooo glad that I made a muslin of his shirt first so that I could test out the fit and get the workings of a man’s shirt just right. I made some mistakes, like the button front closure is on the wrong side…. I knew this while I was sewing, but I didn’t want to waste my time changing it….. The only thing I have to change with the fit is the collar, as he wants it a little bit looser. All in all, I think I just a good job for the practicer. I used up some old buttons and made this into a wearable garment. Only thing is, the fabric is itchy and he doesn’t want to wear it…. I tried it on and he was right! I used McCalls 2447 and used some shirting fabric that came in a mystery fabric bundle from Fabric Mart. This fabric is itchy, like stated before and I still have some left, so I think I will make some kitchen linens with it. And no, I didn’t bother ironing or hemming this…. I am making a different view of this shirt, as this is the more casual one. 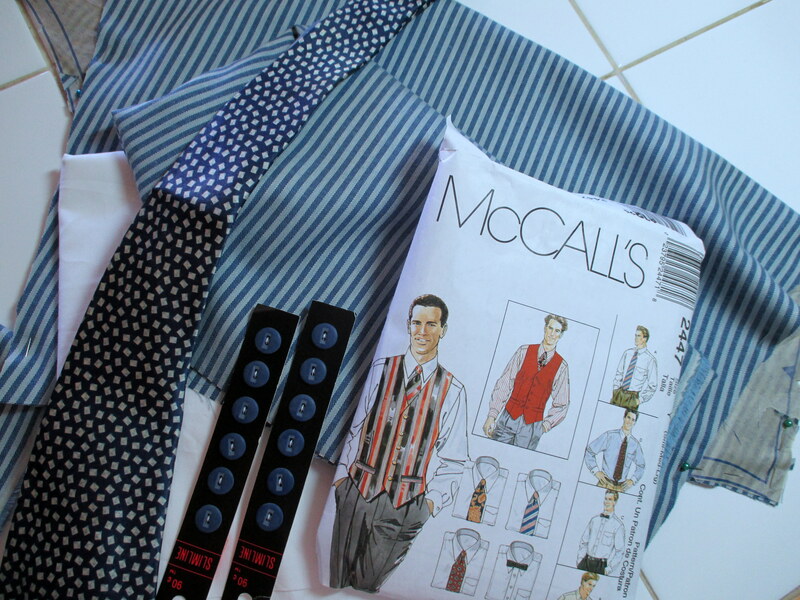 The one I’m making has a wider collar, collar stays, and wider cuffs with cuff links. 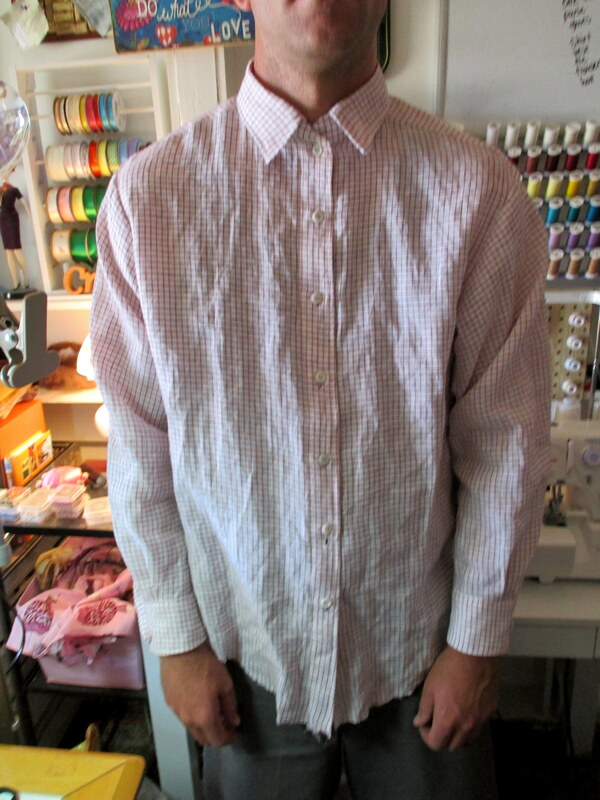 I am making a classic dress shirt in a blue Burberry herringbone stripe shirting with white cuffs and collar. I happened to luck out and find this fabric a while back on Fabric Mart deeply discounted to $2.50/yd. 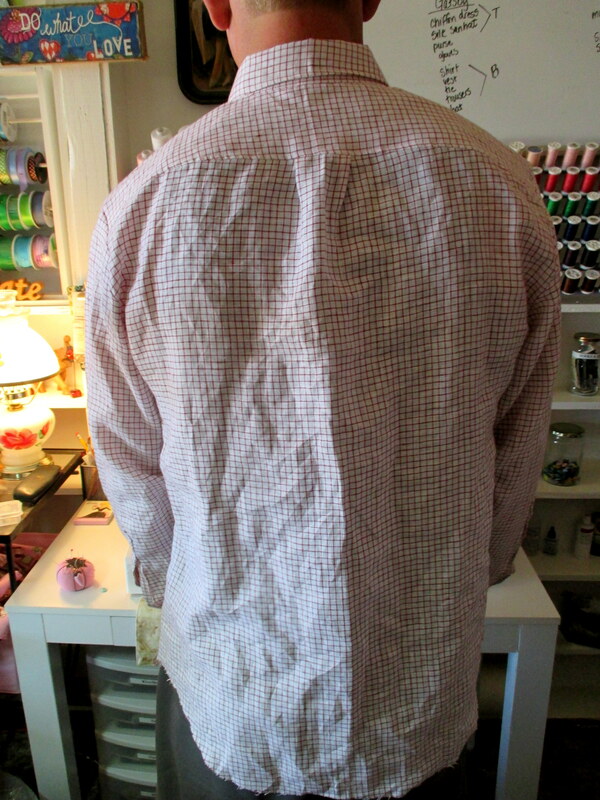 It is a sublime shirting with a little bit of a sheen. I also bought four yards of it in a burgundy stripe that I will someday use in a garment for myself when I can figure out which garment…. « Winter Sewing Swap Goodies! Oh my goodness, I totally want to see your Great Gatsby makes!! I just sewed and blogged a drop waist dress and really love the fashions of the 20s. Wish I was going to the Gatsby Summer Afternoon, I could wear my new dress! The shirt is looking good, as well! I’m looking forward to it as well! I’ve had many of the patterns and fabrics for months and a picture on my head and can’t wait to see it all come to fruition.